Autumn is the perfect season to visit Western Colorado... amazing weather and unique events make the fall festival season a reason to return again and again! Sometimes, falling in love is easy: an awestruck first glance or a memorable first encounter. At other times, take a bit longer—say, 26 miles longer. Luckily, Grand Junction, Colorado has plenty of opportunities this fall for you to visit and fall in love, whether your passion is for vintage cars, high-flying airplanes, spectacular art or even a heart-pounding race. Here’s what to look forward to in Grand Junction this September, October and November. Utilizing the outdoor Amphitheater at Las Colonias Park located on the banks of the Colorado River, Pork and Hops brings together delicious BBQ and live music. The 2018 lineup for musical acts on Friday and Saturday nights will be announced soon! Colorado’s largest wine festival returns for the 27th year. Take in all that Colorado Winefest has to offer from food and wine pairings, chocolate and wine tastings, educational seminars and more. The “Festival in the Park” takes place on Saturday and is the state’s largest and oldest wine festival featuring dozens of Colorado wineries, live music, a grape stomp, chef demonstrations & seminars. Earn all of that wine at Colorado Mountain Winefest by riding in the Tour de Vineyards. The 25th annual event ushers in fall with a scenic and leisurely tour of Colorado’s Wine Country. Choose the 23-mile or 58-mile course. The 16th Annual Downtown Car Show gives automobile aficionados an opportunity to view cars, talk with owners, shop and dine on beautiful Main Street. Vote on the people’s choice award or just stroll the street and admire the spectacular display of muscle, vintage and modern rides. Often referred to as the "Granddaddy of Festivals on the Western Slope, the Fruita Fall Festival offers three days of events, including a parade, outhouse race, carnival, golf tournament, over 125 vendors and live music on two different stages. The Circle Park stage will feature Nashvilled recording artists, Halfway to Hazard, regional act, Royal Bliss, as well as national bluegrass bands. Well-known local acts will provide a variety of musical styles on the Civic Center stage. The Tour of the Moon was made famous in the 1980s Coors International Bicycle Classic bike race and later in the cycling movie “American Flyers.” Today, it’s still considered one of the premier recreational road rides in the western United States, with endless vistas of dramatic red rock canyons and monoliths, pinyon-juniper forests, wildflowers and a symphony of canyon wrens on most any given day in the Colorado National Monument. Register early as this is a true “bucket list” road ride and sells out each year. Spectators are welcome to cheer on the riders. The 3rd Annual Downtown Art Festival kicks off on October 5th during First Friday. Visit Downtown galleries and local businesses to see local talent displayed in various forms of artwork. The Festival continues on October 6th with the installation of the 2018 Art on the Corner temporary exhibit. Wander through Downtown galleries and businesses that are hosting artists and performances of all kinds throughout the day. Featuring headliner Trinity Seely, Female Western Singer of the Year, Academy of Western Aritsts, 2012, Song of the Year, Western Music Association, 2014. Other performers include Al Albrethsen, Floyd Beard, Jerry Brooks, Dale Burson, Nona Kelly Carver, Great Western Heritage, Peggy Malone, Terry Nash, Dale Page, Ramblin; Rangers, Rocky Sullivan, and Rod Taylor; this is cowboy poetry and singing at its best in Western Colorado. This 26-mile, point-to-point full marathon along Rim Rock Drive is one of the most scenic marathons in the world. The course winds over the Colorado National Monument, granting views of towering monoliths and sheer-walled red-rock canyons. In addition to individual marathoners, two-person teams can also participate, with each team member running approximately half a marathon. There is also a half marathon option, that is all downhill! Music, food and vendors will be waiting at the finish line at Circle Park in downtown Fruita. To view our full events calendar, click here. 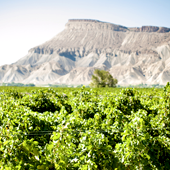 Are you ready to Visit Grand Junction? Order a Visitor Guide. Book your lodging Accomodations. Grand Junction is the largest city in Western Colorado, located at the junction of the Gunnison and Colorado Rivers, between Salt Lake City and Denver on Interstate 70. At an altitude of 4,586 feet, warm summers and moderate spring, fall and winter seasons allow for incredible year-round outdoor recreation opportunities. Among Grand Junction's spectacular red cliffs and winding canyons are the 11,000-foot Grand Mesa and the breathtaking 7,000-foot Colorado National Monument. Surrounded by an abundance of public lands, Grand Junction is also a mecca for hunting, fishing, dirt bike and ATV riding. Other attractions include three national scenic byways, rafting, boating, golfing skiing, extensive public art displays, museums, and a vibrant downtown featuring creative culinary options, shopping, Two Rivers Convention Center and the Avalon Theatre. Visit Grand Junction is a department of the City of Grand Junction and is the official Destination Marketing Organization (DMO) for the region. 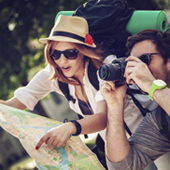 Depending on your trip’s budget and schedule, you can travel by car, train, plane or bus.